HUNTINGTON, WV (HNN) – Designated as one of the first West Virginia cities feeling the impact of the state’s actuary switching from 2002 national assumptions to 2009 Almost Heaven actuarial assumptions, members of the Huntington City Council finance committee and the Mayor Kim Wolfe administration worked for about four hours on the $4.2 million dollar shortfall. Council Finance Director convened the meeting with a “we have work to do” sense of imperativeness; however, by a midway recess two philosophies for finding the funds emerged. Led by council member Jim Insco , who has assumed the role of sacred cow slayer, he reflected the disappointments expressed earlier by Williams and himself --- that the administration had chosen to fill in the funding gap with few cuts and mostly tax increases. On the other hand, Mayor Wolfe’s proposals ensure that a repeat of the Felinton administration’s wholesale layoffs do not send the City of Huntington regressing due to the pension crisis. Left unsaid, whatever the combination of proposals, the outcome will not be pretty. Additional options, one week furlough (all departments), savings = $280,00; rotating “brown outs” of fire stations (except for Centennial and #2 (near MU), $214,000. On revenue increases, hike the Municipal Service Fee from the current $120 (flat rate) to $180 (flat rate), sunsets July 1, 2012 and a Refuse Fee hike of $5.00 monthly. The finance committee recessed at 9:30 p.m. and will reconvene at 5:30 p.m. Thursday to continue working on proposals. Approximately, $3 million dollars in cuts and/or fee increases have been placed on the table which leaves the city about $1.4 million short in replenishing the underfunded police and fire pensions. At the meeting’s opening, Brandi Jacobs-Jones, director of finance and administration, and Deron Runyon, city finance director, explained additional details of the administration proposed plan, which delays filling positions but avoids widespread layoffs. Ms. Jacobs-Jones indicated that the savings of mass layoffs would be partially absorbed by payouts and unemployment compensation. As part of the presentation to demonstrate the efficiencies of the city’s current budget, the administration offered a per capita budget and city services chart for surrounding municipalities. Huntington operates on about $855 in revenue per capita for its approximately $40 million dollar budget. By contrast, Bridgeport spends $1,665 per capita. 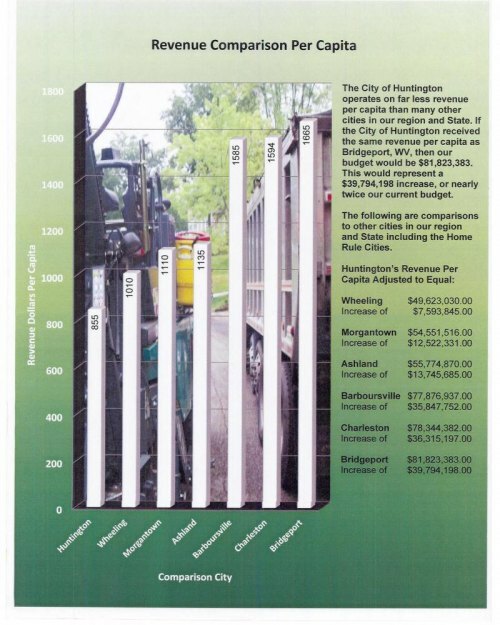 If Huntington spent the same per capita as Bridgeport, it’s budget would be nearly $82 million dollars. However, polite listening to proposals halted when the increase in the “user” /city service fee from $3 a week to $5 a week was discussed. As proposed by the Wolfe Administration, the $5 a week fee would NOT sunset on July 1, 2012. Besides a question of whether the police and paving fee could be in essence used for pensions, Jim Ritter generally branded as “crap” the current needs and challenged the legality of using the fee for making up the shortfall. Mayor Wolfe told reporters, “I think if you ask any citizen are you willing to pay for adequate police protection , pick up garbage and pave the streets, every citizen would say yes, as long as we see a return on our dollar… accountability & reliability. Wolfe feels that the perception of financial waste stems from the federal government. The mayor explained that services would not be reduced under the increase in the user / service fee from $3.00 to $5.00. However, without the increase he may have to ask for police, fire, and garbage pickups at other “than full strength.” Wolfe strongly believes residents would not accept less protection and services. He’s putting his political future on the line, too. Under the $4.4 million dollar pension shortfall, Wolfe called the increase “the right thing to do,” even if it costs him re-election. As strongly as the Mayor agrees with his plan, Steve Williams, Jim Ritter, Jim Insco and others disagree. Williams explained that the tax reform and occupation tax are not the issues. During the recess, city attorney Scott McClure weighed in on the legality of the Mayor’s user fee hike proposal. “The fee should be used to defray the cost of providing service. It doesn’t require new or additional services to be provided,” McClure opined. Translation: As long as the dollar amount is “less than it costs to provide police service” , “It’s perfectly acceptable,” even if the fee is appropriated to “free up” general fund dollars. Although members of the committee had prepared to continue tackling cuts and possible revenue increases, they concurred with a suggestion from Ms. Jacobs-Jones that the administration needed 24 hours to calculate real numbers to several of the committee proposals. At the conclusion of the Wednesday meeting, on the revenue side, the refuse fee increase proposal appeared to have the backing of the committee as questions were asked about special sessions and their timing so it could take effect as early as November 1, 2011. In addition, the $180 municipal service fee appeared supported by the committee. As for cuts, a mandatory one or two week furlough could run afoul of civil service regulations. That issue has to be looked at legally. The rolling fire station brown outs have a possible impediment, too: Federal money funds equipment at some stations. Could they be subject to a brown out? A possibility exists that negotiations with the EPA could reduce the fine or allow it to be applied to storm water upgrades. Concern about temporarily foregoing supplementary fire/police pension contributions. Finally, councilman Nate Randolph inquired if the city has any real estate not in use the could be sold? Prior to the evening’s recess, Williams took a public, personal stand that from his discussion with constituents , the pension crisis “is something that was made within City Hall and we should do all we can to identify reductions [within city hall], then and only then do we look at revenue [increases].” At that time he asked if any committee member disagreed , they should speak up.